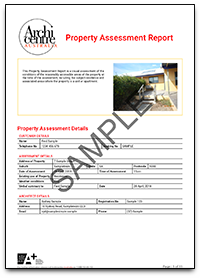 This Report is prepared by Archicentre Australia – a division of ArchiAdvisory Pty Ltd – and in accordance with Australian Standard 4349.1-2007 Assessment of Buildings Part 1: Pre-purchase Inspections – Residential Buildings and any other Australian Standards and definitions cited in the Terms and Conditions. This Report is a subjective assessment prepared by the assessing architect on a visual assessment of the condition of the reasonably accessible parts of the property and on the basis of the prevailing structural, soil and weather conditions at the time of the assessment and does not cover enquiries of councils or other authorities. It is not a certificate of compliance for the property within the requirements of any Act, regulation, ordinance or local by-law. Prolonged periods of wet or dry weather may cause structural changes to the property as described in Archicentre Australia’s Property Maintenance Guide which you can download from the link found in the body of your Report and in the Report cover letter. This Report will not disclose defects in inaccessible areas, defects that are concealed and/or not reasonably visible, defects that may be apparent in other weather conditions or defects that have not yet arisen. This Report is not a rigorous assessment of all building elements and does not cover all maintenance items, particularly those such as jamming doors, windows or catches, decorative finishes and hairline or slight cracks. This is in accordance with Category 0 and 1 of Appendix C -AS 2870-2011. The Report is not a pest assessment. Archicentre Australia recommends that a timber pest assessment be carried out on all properties being considered for purchase. Clients wishing to have a full timber pest assessment should contact Archicentre Australia to arrange a separate pest assessment. Archicentre Australia Timber Pest Inspections are undertaken by highly qualified, independent and authorised inspectors. Archicentre Australia does not sell pest control services so you can trust that you will not be recommended treatments that you do not need. The assessment assumes that the existing use of the property will continue and the Report is prepared on that basis. As such, the assessment will not assess the fitness of the property for any other intended purpose. We advise you to verify any proposed change in use with the relevant authorities. If you are intending to purchase the property, and in consideration of the limitations of a visual assessment, as well as budgeting for the anticipated cost of the recommended repairs and maintenance, Archicentre Australia recommends budgeting a further 5% of the value of the property, to provide a “safety net” against unexpected costs that may arise over the first five years of ownership and that this be taken into account when establishing a purchase price. The amount of this safety net is a rough guide for properties generally and not specific to your property. Where the property is a unit or apartment, associated areas may include common areas pertinent and immediately adjacent to the subject residence, or as specifically instructed by the customer. General and specific additional advice on maintenance matters that your architect has deemed appropriate. Timber, metal or other framing sizes and adequacy. Any items of repair which are common to properties of similar age or type of construction and as described in the Property Maintenance Guide, including decorative features and finishes. further substantial deterioration of the property. further substantial deterioration of the building. In the case of cracking, a serious structural defect denotes severe cracking as defined by Category 4, Appendix C – Australian Standard AS 2870-2011. Your Report is not a pest assessment report. Archicentre Australia recommends pre-purchase and ongoing timber pest assessment in all mainland states and territories. Smoke detectors must be installed in accordance with current regulations. Archicentre Australia suggests that you regularly check these to ensure proper operation. Drought conditions can cause buildings to crack literally overnight. Please note the precautions advised in the referred Property Maintenance Guide and any specific recommendations made in your Report. The condition of timber-framed or concrete decks and balconies deteriorates over time – annual assessments should be undertaken to verify their safety. In the interests of safety, Archicentre Australia recommends all property owners should have an electrical safety assessment undertaken by a suitably qualified specialist. If you are purchasing the property, Archicentre Australia recommends a review of all door and window locks and security systems, appliance and equipment at settlement. The Assessment is limited to the nominated individual property including associated private open space. It is not the scope of this Assessment to include common or other adjacent property. Legal advice should be obtained as to the liability to contribute to the cost of repairs in respect of any common property. The architect can only assess reasonably accessible parts of the property. It is your responsibility to ensure that any inaccessible parts of the property that can be made reasonably accessible for an assessment are made so, prior to the assessment. If parts of the property have been noted as being inaccessible during the assessment, it is important that you contact Archicentre Australia and arrange for a second assessment when access is available. Reasonably and Safely Accessible – Accessible areas which can be accessed by a 3.6 metre ladder or those which have at least 600mm unimpeded vertical and horizontal clearance without the removal of any fixed or unfixed furniture, fittings, stored items, cladding or lining materials, plants or soil. Architect assessors are unable to access areas where there is a risk of adverse disturbance or damage to the property. This includes the garden area. The architect will determine the extent of accessible areas at the time of the assessment. Workplace Health and Safety access conditions apply subject to relevant State and Territory regulations. Architects are unable to assess areas higher than 3 metres above ground level unless secure ladder access is available and fall prevention devices or barriers are present. Reasonable Access may not be possible due to physical obstructions or conditions that may be hazardous or unsafe to the architect. Access restrictions will be noted where appropriate. The Report has been prepared by Archicentre Australia – a division of ArchiAdvisory Pty Ltd – and the named architect and is supplied to you (the named Client) on the basis of and subject to the Scope of Service and the Terms and Conditions of the Contract and the Assessment and Archicentre Australia accepts no responsibility to other persons relying on the report. The Report has been prepared in accordance with Australian Standard 4349.1-2007 Assessment of Buildings Part 1: Pre-purchase Inspections – Residential Buildings and to any other Australian Standards and definitions cited in the Terms and Conditions. Please note that having provided to you an opportunity to read the Scope and the Terms and Conditions following upon you making a booking for the Property Assessment, the architect has proceeded to conduct the assessment of the property and Archicentre Australia has proceeded to supply this Report on the basis that you have accepted the Scope and the Terms and Conditions and/or are deemed to have done so upon the architect arriving at the property. The Report is to be read in conjunction with all other Archicentre Australia Reports issued concurrently for the property. The Scope of Service and the Terms and Conditions take precedence over any oral or written representations by Archicentre Australia, to the extent of any inconsistency. After making the booking, the client is deemed to have accepted these Terms and Conditions and Scope of Service upon the architect arriving on site. The Report is not a guarantee but is an opinion of the condition of the assessed property relative to the average condition of well maintained similar properties of a similar age. Archicentre Australia accepts no liability with respect to work carried out by other trades, consultants or practitioners referred by Archicentre Australia. It is your responsibility to make appropriate contractual arrangements with such person. The Report is not a certificate of compliance for the property within the requirements of any Act, regulation, ordinance or local by-law. Archicentre Australia does not accept responsibility for services other than those provided in this Report. Archicentre Australia’s liability shall be limited to the provision of a new assessment and report or the payment of the cost of a new assessment and report, at the election of Archicentre Australia. The assessment assumes that the existing use of the building will continue. The assessment will not assess the fitness of the building for any intended purpose. Any proposed change in use should be verified with the relevant authorities. The Property Maintenance Guide constitutes a vital part of the architect’s recommendations and failure to observe either the recommendations or the Property Maintenance Guide could lead to premature deterioration of the property. The Health and Safety Warnings constitutes a vital part of Archicentre Australia’s recommendation to you. Failure to observe the provisions of the warning sheet could jeopardise the safety of the occupants. The Report and its appendices and attachments, as issued by Archicentre, Australia takes precedence over any oral advice or draft reports, to the extent of any inconsistencies, and only the Report and its appendices and attachments, which form a vital part of the architect’s recommendations, shall be relied upon by you. If you are dissatisfied with the Report you agree to promptly give Archicentre Australia written notice specifying the matters about which you are dissatisfied and allow Archicentre Australia to attempt to resolve the matters with you within 28 days of receipt by Archicentre Australia of such written notice before taking any remedial action or incurring any costs. Reference to Archicentre Australia in this Report and any other documentation includes, where the context permits, its agents and representatives authorised to act on its behalf. These Terms and Conditions are in addition to, and do not replace or remove, any rights or implied guarantees conferred by the Competition and Consumer Act 2010 or any other consumer protection legislation.